Ben Brumfield of FromThePage Open-Source Transcription Software shared his experiences from small crowdsourcing projects. He noted that many organizations often object to public participation in scholarly projects because they don’t have the skills or expertise, but he’s found that those people participating are self-selecting and highly focused. Participation is not equally distributed but mostly done by a small number of people, thus it’s not really crowdsourcing but nerdsourcing. He provided some examples of “well informed enthusiasts” conducting exemplary work, such as a retired petroleum worker who volunteered to transcribe an 1846 diary in 14 days with two dozen footnotes. It came about when a staff member responded to his email with a note, “although you’re interested in this topic, you might be interested in this related resource”. To harness these volunteers, projects need to include extrinsic motivators, such as an automated listing of “top ten” transcribers, editors, and indexers. 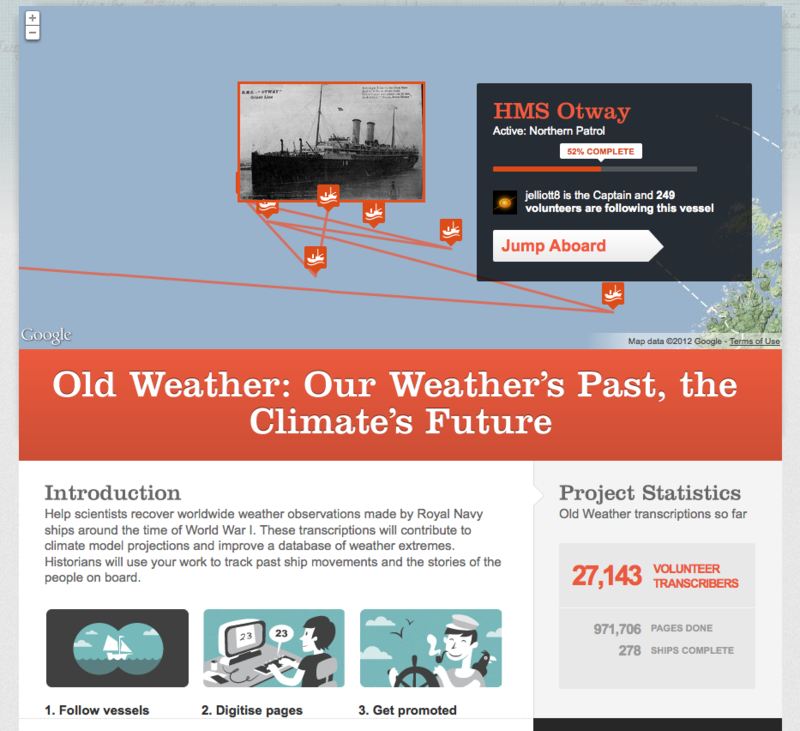 For example, OldWeather.org includes a variety of project statistics and “promotions to captain” to keep volunteers motivated as they transcribe old weather reports. For more about the theory of crowdsourcing in scholarly contexts, he recommended following the work of Alexandra Eveleigh at the University College London. David Klevan of the Holocaust Museum discussed a couple projects that address the management of large collections. For example, the Holocaust Museum receives about 1000 requests per month about specific people, but their archives of 170 million documents are not searchable by name. In partnership with Ancestry.com (they had software and expertise), they created the World Memory Project to index these records through crowdsourcing. The museum provided digital scans, volunteers transcribed the records, and the data is shared by both organizations. So far, 2400 people have indexed over one million records. 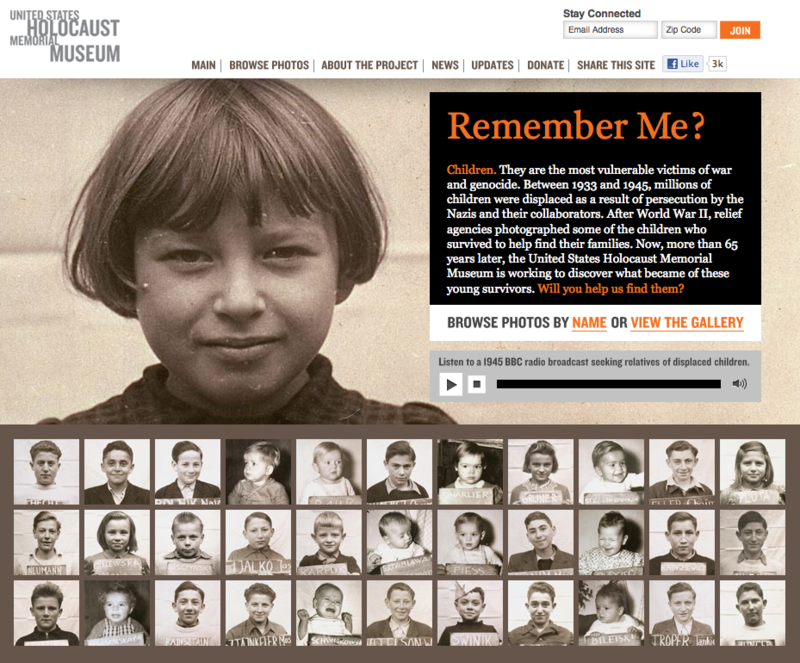 A second project is Remember Me?, which attempts to collection information about the 1100 children who were displaced after World War II. User can share the project through Facebook, leveraging the person’s familial networks. At this time, 300 survivors have been identified and it attracted 156K visitors in the last year, so it works effectively both as a crowdsourcing project and as social marketing. The third project discussed was Children of the Lodz Ghetto, which both tries to find out what happened to the ghetto’s 14,000 children and to teach people how to do history. Their strategy is to get people to answer questions they are interested in, not what the museum is interested in, and to work with others to complete project (confirm identify, develop biography, edit, verify). The website provides updated statistics on progress overall and individually, identifies expert reviewers (power users) and so far, 650 volunteers have researched more than 2000 students and nearly half of the submissions were valid (which led to improving resources for conducting research). Map Warper: Interface with Google maps that allows the public to digitally aligning (“rectifying”) historical maps from the NYPL’s collections to match today’s precise maps. Exportable as KML files. In 2 years, 1600 volunteers and 3000 maps rectified. What’s on the Menu? Historic menus are produced in various formats and typefaces, and often contain unusual words, so developing finding aids and indexes is only possible through hand transcriptions. This project was so popular that in ten months, 790,000 dishes were transcribed from 12,500 menus and resulted in nearly 3 million page views (far exceeding the total views for their online exhibits combined). This project received the 2011 Roy Rosenzwieg Prize for Innovation in Digital History. 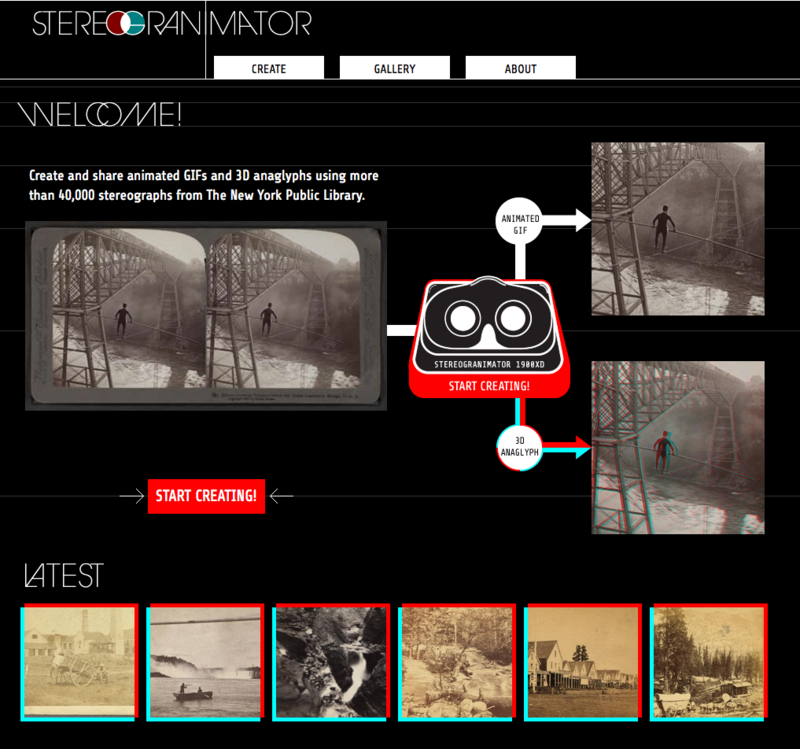 Stereogranimator: Inspired by the work of Joshua Heineman, NYPL Labs created a tool that allows visitors to create animated gifs and 3D anaglyphs from scanned stereographs, which may be later be ranked for accuracy. In one month, 25,000 creations, 93K visitors. Putting up as quick experiments that are hopefully repeatable and fun, but what they don’t know is who is using it. They would like to know their well-informed enthusiasts so they can tiers of access and communities. For more details on using volunteers for online projects, see the Citizen Science Alliance; Konrad Lawson on crowdsourcing transcription software in the Chronicle of Higher Education; and a video of Ben Vershbow’s presentation on “hacking the library” at CUNY’s Digital Humanities Initiative. This entry was posted in Collections, Community engagement, Historical interpretation, History, Social media, Technology and tagged Ben Brumfield, Ben Vershbow, David Klevan, FromThePage, Holocaust Museum, New York Public Library on April 23, 2012 by Max van Balgooy. I had completely forgotten about Sparked.com. Thanks for the reminder, Robert! Have any museums, historic sites, or history organizations tried this? I have used Sparked.com to critique our e-newsletter, translation, and a few other tasks – has been a great experience.